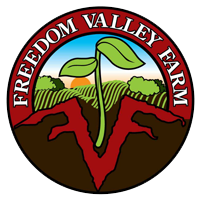 Freedom Valley Farm is a grower of fine, naturally cultivated vegetables, fruits, and other produce. Located in Freedom, Indiana amongst the valleys of southern Owen County; the farm is known for the quality and freshness of its seasonal produce. What is a “CSA”? Community Supported Agriculture (CSA) is a relationship between our farm and you as our customer. Rather than simply purchasing food, our customers become “members” who receive a portion of the farm’s harvest. Our CSA is called the Local Fresh Produce Plan (the plan), and it’s your opportunity to support, participate in, and learn about, the exciting sustainable agriculture movement. Farmers are custodians of the land’s soil; one of the few truly necessary resources on this planet. Smaller, solitary farms like ours lessen the health risks associated with large concentrated operations; where vast quantities of goods can be contaminated by a single event. Local communities benefit as the farm provides employment opportunities and free enterprise economic activity that helps sustain desired standards of living. Locally Grown…. All produce is planted, raised and harvested on our farm. Conveniently Healthy .… a time saving way for you to introduce, just-picked, seasonal produce into your daily meals. The plan provides fresh, delicious, wholesome food for you and your family to enjoy. Naturally Cultivated …. Freedom Valley Farm uses natural and organic farming practices; so you have access to non-toxic healthy food that is grown using chemical free methods. Large Variety of Seasonal Produce …. More than 40 crop varieties in seasons throughout the year. Weekly Fresh Produce …. Typically 20 or more weeks in the summer, and 12 or more in the winter. Shitake mushrooms Option can be added to either plan above. Pay by credit or debit card, either online or over the telephone. Pay by check, send by mail or in person. Online via PayPal Credit™, customized, interest-free installment payments over 1 – 6 months. For more information see: www.paypalcredit.com. Pay by credit/debit card or check at our farmers market stand. Pick Up Locations .… Plan shares are delivered to specific locations on a weekly basis at designated dates and times. Several locations in Bloomington are usually available at convenient times. Additional Orders …. During the Plan season additional products are available on a weekly order basis. Telephone orders will be accepted up to two days before your weekly delivery date. Orders will be included with the weekly Plan delivery, and payment can be made in advance or on delivery. Members can check our website to see if additional orders can be made at our online store.